Propelled by a real passion for beekeeping, we are actively involved in safeguarding the bees and turning the spotlight on the great work they accomplish. We explore the four corners of the Earth, eager to discover new flavours, mindful of making significant gestures in the fight for the bees’ survival and relentlessly acquiring new ways to improve. Despite all the energy expended, each one of us is aware that we cannot make a difference alone. Protecting the bees is a vision of society! As long as important changes in our agricultural models are not implemented, bees will continue to die. 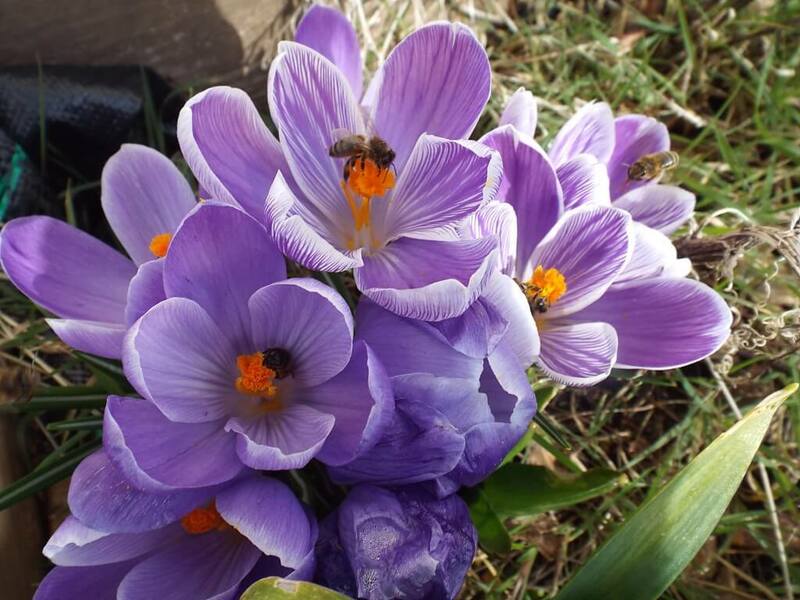 Indifference to the plight of the bees is explainable in part, by the fact that not enough is known about this amazing insect by most of us – even though it is responsible for bringing colour to our food plate and feeding us by pollinating more than a third of the food we eat! The other part comes from a lack of will in changing our eating habits towards eco-responsible choices which, in turn, will put pressure on governments and the agrochemical industry. Political authorities must absolutely get involved to set in motion a movement for the protection of bees, pollinators, and ecosystems. The urgency of reconfiguring agricultural models is required to harmonize the way things are done, to reassert the importance of crop diversity, to rehumanize agricultural work, to reduce the area dedicated to monoculture and to invest in a sustainable development benefitting pollinators. This approach must take form in a greater collaboration between farmers and beekeepers to make sure that realistic solutions are conceivable and applicable. We must urgently intervene and rethink the certification process and the use of pesticides by favouring, in particular, an agricultural approach less dependent on chemical inputs. Beekeepers have the potential of becoming important players, first line informants about how diverse pollution sources, direct and indirect, are affecting the bees. 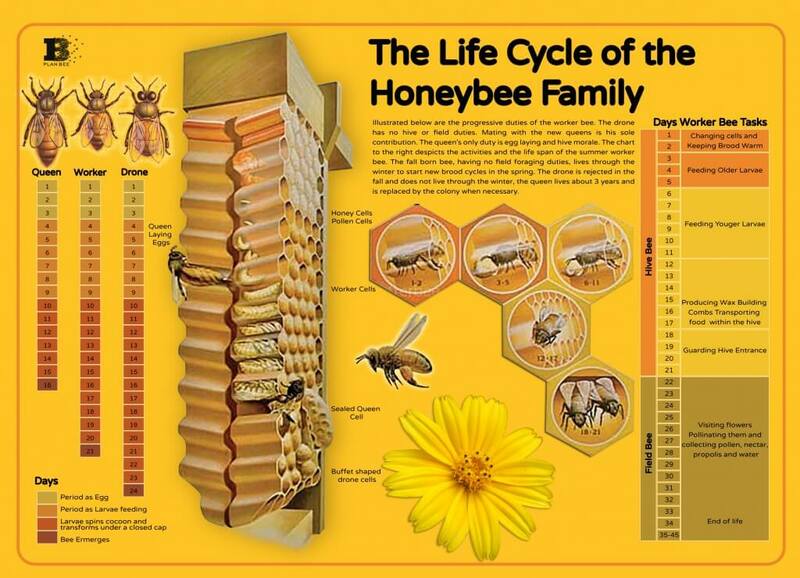 The bee is an incredible bio-indicator, a true barometer measuring the quality of our environment. While shuttling back and forth between the beehive and its natural surroundings, the bee takes stock of the health status of ecosystems by performing a biopsy of all it gathers. Plants, water, soil, air particles; everything that surrounds us is, in part, taken as a sample by the bees, which provides us with an imprint of the environment. The last twenty years have seen a decline in bee populations. This imprint is disturbing, symptomatic of the environment’s sick state, a diagnosis that reveals the repercussions and consequences this decline will have on human life and biodiversity on a planetary scale. We hope to see the creation of a community that, as a bee colony, will get the job done together. The time has come to breathe life again around us, to make eco-responsible choices about what goes on our food plates, about the plant diversity that colours our fields and on the responsible development of our countryside. It is imperative that the choices we make protect and preserve our planet because we do not inherit the Earth from our ancestors, we borrow it from our children and future generations. All of us should honour and respect this aboriginal wisdom. Green Legacy project participants, Kilsyth Academy are taking on the responsibility of a hive, having participated in a series of talks and beekeeping lessons given by Plan Bee Ltd. All schools that take part in this eco-initiative receive a blank beehive that they are encouraged to create a design for and then paint – we wrote earlier about North Lanarkshire schools Kilsyth Academy and Braidhurst High, choosing and developing their themes in earlier articles. 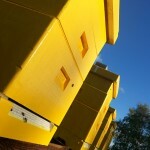 Now these fantastic hive designs have been approved – let the painting commence. You can see the whole process illustrated below. We’d like to say thanks to all staff and pupils at Kilsyth Academy involved in this worthwhile project who have taken to it with great enthusiasm to produce some stunning designs! 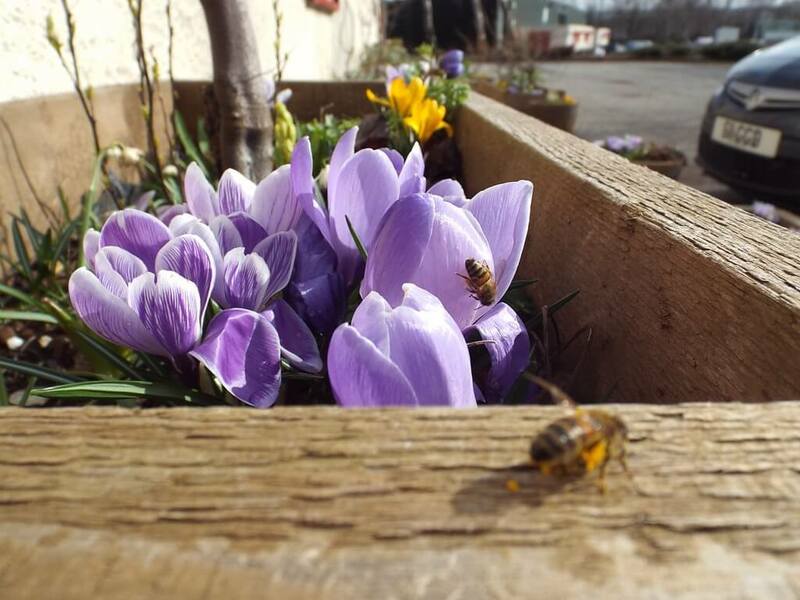 News: Spring is now Official – Our Bees are out! 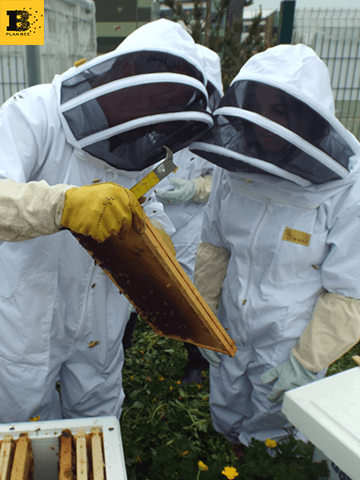 This year, the school will actively run a hive with its own colony of honeybees, but first, students learn the role of pollinating insects in our food chain and why it’s important to establish the hive – which will be done once it is painted. 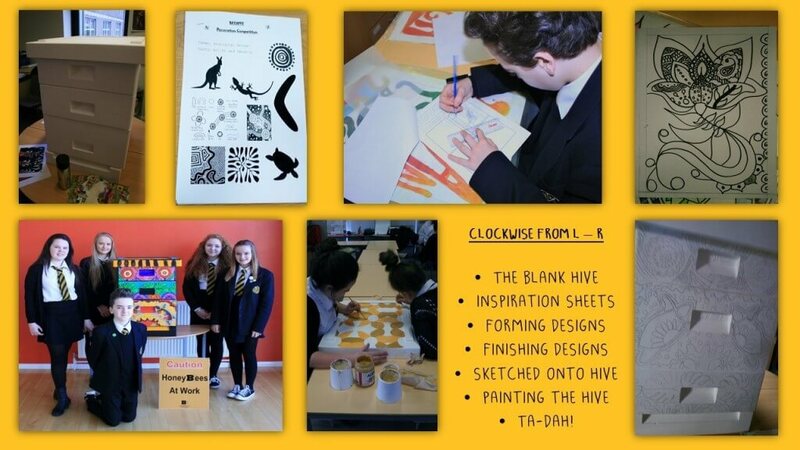 Teachers from the Social Subjects and Art and Design departments have been working with the students to encourage and develop designs for the school beehive. Art teachers Duncan Chisholm and Paul Clifford undertook a design unit with S2 and S3 students drawing inspiration from battlefield images from during and after the conflict. The completed artwork went on display and school staff voted for the images they would like to see painted onto the hive. 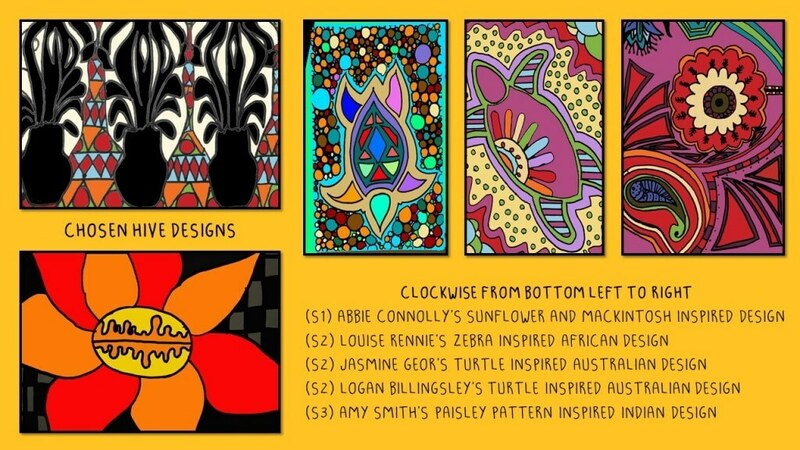 Five talented winners were chosen to transfer their designs on to the hive: Denisa Bednarova and Zafar Khan of S2 and Nicole Collumb, Emma Ewart and Zoe Oliphant of S3. Each pupil received an art kit including paints, pencils and a sketch book as an additional reward for their efforts along with a jar of delicious honey, courtesy of Plan Bee Ltd. We’d like to say a big thank you to project co-ordinator Kirsty Logan for driving the project forward, a well done to the winners and also our appreciation for Braidhurst pupils that might not have won, but are really getting involved and understanding the importance of bees and their chosen theme. Four of the winners (L-R) – Denisa Bednarova, Zoe Oliphant, Kirsty Logan (Project Coordinator), Emma Ewart and Zafar Khan.